If there was anything we learnt from the Oscars red carpet this year, is that pink is in. 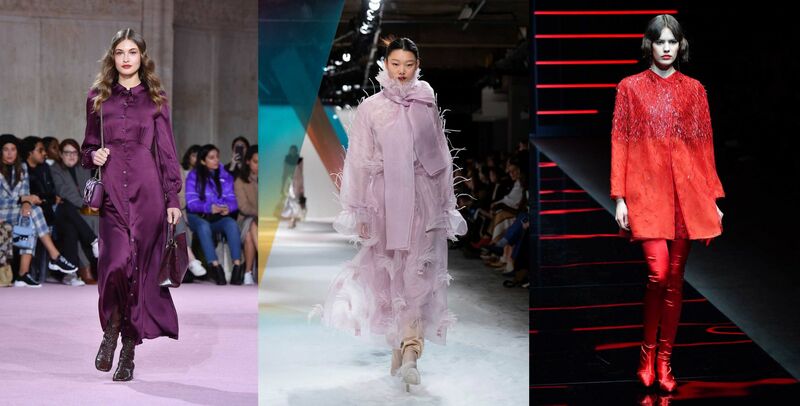 Whether you’re a fan of the soothing hues of millennial pink, or the shock factor of attention grabbing neon, designers showed that there was more than one way to pull off this colour. After Marc Jacobs sent out giant ruffled dresses reminiscent of shower loofahs in his spring/summer 2019 show, we knew we had to prepare ourselves for the impending arrival of ruffles. The trend continued into autumn/winter 2019, with frilly dainty maxi skirts seen at Bora Aksu and large, over-the-top ruffle tops seen at Alberta Ferretti. If you’re going to experiment with textured fabric this season, let it be accordion pleats. Pleats may play well with a delicate blouse and pearls, but designers also displayed a myriad of ways to work alternative looks with this trend, from tough and edgy at Longchamp to whimsical and ethereal at Dior. 1980’s style continue to dominate the runways with huge oversized bows. But these aren’t your romantic bows of yesteryear. Autumn/winter 2019’s bows are ostentatious, bold, and meant to be the standout out trend of the season, literally. Remember the times when you used to raid your parent’s closets as a child? Well your childhood memories are now a fashion trend as huge, oversized coats are set to become a thing this season. A trend that’s comfy and yet fashion forward? Now, that’s something we can totally get behind. Let your fashion senses go wild with the season’s reiteration of an age-old classic—the leopard print. Instead of featuring the print in subtle ways, designers chose to let the print be the main focus, with brands such as Phillip Plein and Saint Laurent adding a rock ‘n’ roll twist. While florals for spring aren’t usually ever considered ground breaking, the rules are different for autumn. Cheery botanicals take a brooding turn with darker and somber colours with designers sending out long maxi dresses that’s perfect for winter layering. We’re not sure if the musical Joseph and the Amazing Technicolor Dreamcoat was a big inspiration for designers this season as plenty of them sent out looks that were quirky and colourful. Colour could be seen in plenty of shows from solid colour blocking at Prabal Gurung, to pattern clashing at Benetton. As soon as the temperature drops, it’s time to ditch those springtime linens and trade them in for the warmth of leather. This time the focus wasn’t just on the standard leather jackets, designers sent leather separates such as skirts at Gabriela Hearst and Burberry as well as a full leather shorts suit at Tod’s for the slightly more adventurous. As the feminist movement continues to take off with #MeToo and #TimesUp, designers show us that as long as we want to wear the pants in anything we do, they’re going to keep making them for us. Whether you like it sleek and tailored as seen at Tom Ford, or laissez faire like at Zadig & Voltaire, there’s endless variations for you to choose from. After several seasons of oversized streetwear dominating the market, it’s back to cinching your waist in, or as the kids like to say, “snatched”. For an updated take on this trend, aim for wider, corset style belts that will add a tough edge to feminine styles. It’s also the perfect item to add definition to another trend of the season, the oversized coat. Sometimes bigger is better, at least when it comes to proportions. Power shoulders were a common sight, with boxy tailoring taking front and center this season. Unlike its former predecessors of the 1980s and 1990s, the trend has now taken a modern spin, with designers playing with cuts and fabric instead of leaving it all to heavy shoulder padding. One way to make yourself look taller than you are without having to actually wear heels? Monochrome dressing. Designers make the case for head-to-toe dressing with models striding out confidently in all colours of the rainbow. While it might be relatively to try this trend out using neutrals like black and white, take yourself out of your comfort zone by experimenting with brighter hues. Fashion How Will Chanel Pay Tribute To Karl Lagerfeld?